In the world of social media marketing, it may seem like you need to sell drool-worthy donuts or cute athletic wear to generate followers or see results. But CASE Credit Union’s digital marketing strategy is proof that social media success is about much more than just pretty pictures. Over the past year, BCP has had the privilege of working with CASE Credit Union’s digital team to help expand and support their robust social media presence. In that time, their social media pages have experienced tremendous growth in online reach and user engagement. The brand has even expanded into new social media territories, like Instagram and Pinterest. While you can’t place your hands on the products CASE Credit Union provides (okay, maybe you can wrap your hands around your credit card or smartphone), they still find exciting ways to engage with users, advertise products and share their brand’s unique story. Here are a just a few of the ways CASE Credit Union is killing it on social media. If you want your posts to stand out in all of the chatter on social media, make sure it’s relevant to your audience and provides value to them. One way to do this is to publish educational content. 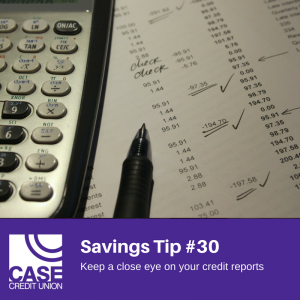 Across all of their social platforms, CASE Credit Union posts savings tips to provide new ideas for how their followers can save money. They post the tips each week and compile them into an album on Facebook and a board on Pinterest. By posting educational content, CASE Credit Union establishes itself as an expert in savings strategies and keeps every section of their audience engaged and interested in their content. While only a small fraction of their audience may be interested in the credit union’s latest mortgage or credit card offering, everyone can benefit from financial tips. Several times a year, CASE Credit Union publishes social media profiles of their small business partners. These posts are simple—just a short quote and a photo of the business—but they show CASE Credit Union’s business clients how much they value them, their opinions and their experiences. Directly tagging those clients in the post expands reach for the benefit of both parties—it ensures that the credit union’s audience can interact with the business partner’s page and that the business partner’s audience can see how great CASE Credit Union is for business banking. One aspect that makes CASE Credit Union stand apart from their competition is their devotion to the community. They have a 501(c)3 non-profit organization called CASE Cares, an all-volunteer nonprofit organization dedicated to making a difference for those in need. Each time CASE Credit Union employees and volunteers are out serving in their community, the digital team captures compelling images to share on the brand’s social media pages. By posting these photos and tagging the organizations that they partner with, they increase the post’s reach and increase awareness about local charity organizations. But it’s about more than just metrics. These posts help CASE Credit Union tell an important story about their brand. Users love to see the real faces behind the brands that they love. Posting photos of #CASEintheCommunity shows followers that CASE Credit Union is more than just a credit union, and their commitment to our region spans beyond words in a mission statement. It’s about the time and energy that a team of compassionate individuals put into their community every day. Videos are one of the most engaging ways to tell your brand’s story and showcase your products. Each month, CASE Credit Union publish short social media videos that show their team supporting local organizations and events, describe the credit union’s latest product, or show users a behind-the-scenes look at life around the office. Short, concise videos can be a huge asset for expanding your brand’s digital reach. And with features like auto-play, you can make sure that viewers are into your video content in a snap.